The picturesque village of Old Leighlin is home to one of Ireland’s gems of late medieval architecture. 1. 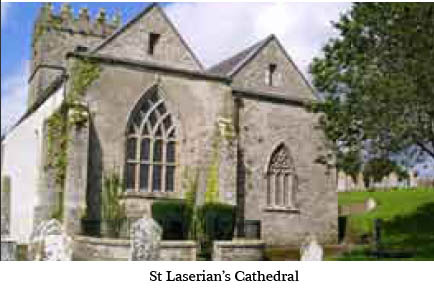 St. Laserian’s Cathedral, Carlow’s oldest working building, was built on the site of a monastery founded by St. Gobban c. 600. St. Laserian (Lasrain or Mo-Laise) became abbot c. 620 and the settlement grew to eventually accommodate some 1,500 monks. 2. The holy well which can be found 100 metres west of the church is dedicated to St. Molaise and features an early ringed cross said to denote the place where St. Laserian conversed with St. Finbar of Cork. 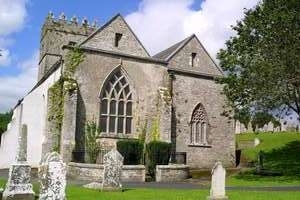 Laserian, who was originally from Ulster, is celebrated for the Synod held in Leighlin in 630 at which the Irish Church adopted the Roman method for arriving at the date of Easter. 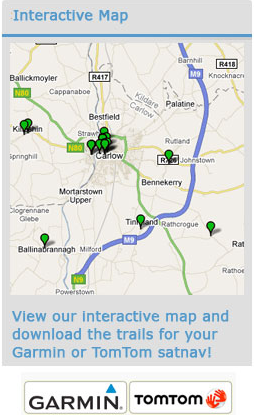 In 1111 Leighlin was constituted a diocese and thereafter the church here assumed cathedral status. The present building was started by Bishop Donatus (1152-85) and continued under his successors. Much of the fabric dates from the twelfth and thirteenth centuries. The tower dates from the late fifteenth century, while the Lady Chapel was attached to the north side of the choir in the sixteenth century. The church consisted of the long chancel and nave of the present building with transepts to the north and south. No trace of the south transept survives and the north is present in an unroofed state. St. Laserian’s Cathedral features architecture from every century since it was built. The stone interior of this beautifully preserved church is illuminated by large Gothic style windows and a magnificent stained glass window behind the altar. One of the glories of the cathedral is the intricate ribbed vault of the crossing tower. The beautifully carved sedilia reflect the cathedral status of this building. 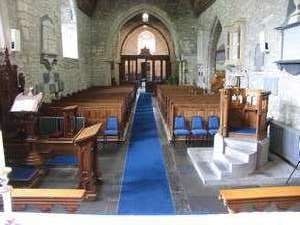 This is one of the few churches in Ireland that has four seats, rather than the usual three. It is suggested that the fourth seat was for the Bishop. 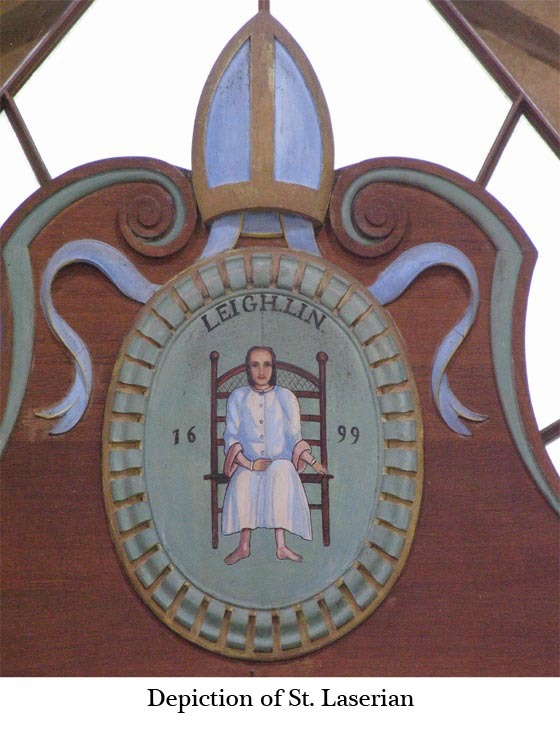 Cathedrals normally provided a special chair for the bishop but Old Leighlin may have just provided a place on the sedilia. 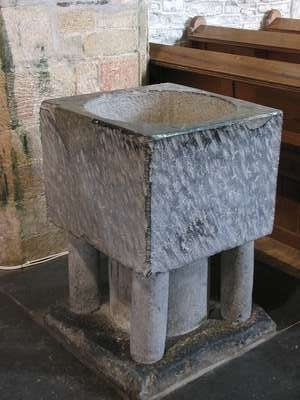 There are two fonts in the church, both of which are older than the building. 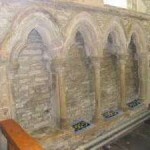 The earlier font consists of a massive piece of Kilkenny marble, hollowed with rough hand tools. 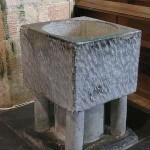 The other font known as the Gowran font is more decorative. There are some fine nineteenth century pieces in the cathedral. 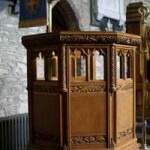 The Bishop’s throne is richly carved as is the timber lectern in the traditional form of an eagle. 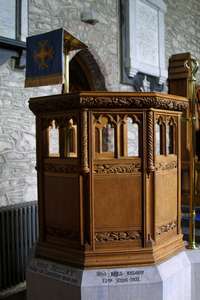 This lectern was made in memory of Thomas and Sophie Vigors. 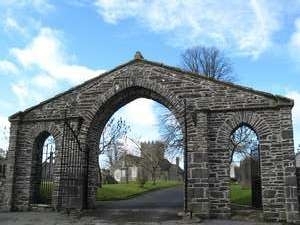 The Vigors family of Burgage, Leighlinbridge was closely associated with the church and there are thirty two memorials to the family throughout the building. The east window designed by Catherine O’Brien, is a beautiful memorial, depicting Saints Moling, Bridget, Fiach, Canice, Patrick, John, Paul and Laserian. There are several interesting floor tombs and the O’Byrne altar tomb (1569) opposite the south door has unusual iconography. The date on which Easter is celebrated has always been a cause of difficulty and disagreement throughout Christian history. The main Latin churches throughout Western Europe used the Roman system of prediction. In the seventh century the less accurate Celtic system was in use in Ireland. This caused unnecessary dissent and St. Laserian overcame the problem persuading the Irish Bishops gathered in the Synod of 630 to adopt the Roman system. This was no mean feat given the Irish church’s tradition of independence in thinking and practice but it greatly helped in unifying the church. This achievement was confirmed for the Western Church at the Synod of Withby in 664 A.D.
Open : end May – end September, Tuesday – Saturday 11 a.m. – 4.00 p.m. or by arrangement. T: 059-972 1570, Guide available on request. Choir: Part of a church commonly occupied by singers, situated between the nave and the chancel. Gothic: Style of architecture, originating in the middle ages, characterised by pointed arches. When used in more recent times, it is described as neo-Gothic or Gothic revival. 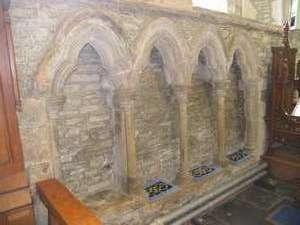 Sedilia: Seats for clergy on the south side of the chancel, often located in niches.